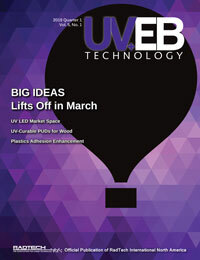 Innovations in Optics, Inc., Woburn, Massachusetts, has introduced LumiBright™ UV-LED Light Engines, powerful solid-state sources that are being used within OEM equipment applied to photocuring of adhesives and coatings, as well as photomask exposure systems for photolithography. LumiBright™ UV-LED Light Engines feature UV die arrays bonded on MCPCB substrates that enhance thermal performance for high current density operation. The specialized primary optic is a non-imaging concentrator made from fused silica, ideal for high power UV flux. With active cooling, the 2400B-405 model can emit greater than 20 W from a 7.5 mm diameter clear aperture with a 0.66 numerical aperture (NA). Model 2400B-505 light engine can produce over 10 W of radiant flux from a 5 mm diameter clear aperture with 0.60 NA. LumiBright UV-LED Light Engines are available with wavelengths centered near 365 nm, 385 nm, 395 nm and 405 nm. For photolithography, 435 nm LEDs also are available. For spot curing applications, LumiBright UV-LED Light Engines easily couple to liquid light guides for the ultraviolet. For more information, visit www.innovationsinoptics.com.